Hard to believe this bundle is still in stock! If you’re a fan of donut flavors, I’d definitely recommend checking out this deal from our friends over at CheapEjuice. They’re still selling the Donut Town E-liquid Bundle (300mL) for only $20! That works out to about $6.66 per 100mL, which is an absolute bargain in my book. 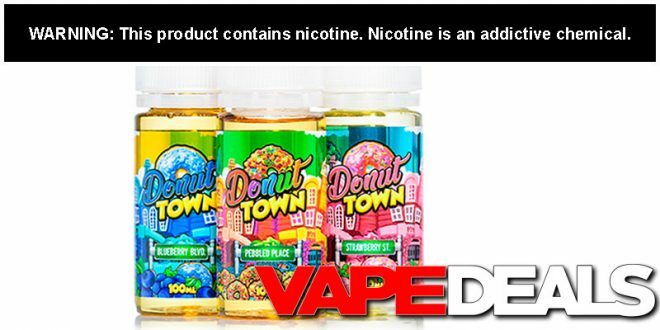 Each bundle includes all 3 Donut Town flavors in your choice of nicotine (0mg, 3mg, 6mg). You can check out the flavor profiles down below. CheapEjuice offers $5 USPS Priority Shipping to anywhere in the US.